Place cereal in resealable food-storage plastic bag; seal bag and crush with fingers to 3/4 cup. In medium microwavable bowl, microwave white vanilla chips as directed on package until melted and stirred smooth. Add crushed cereal; stir until well coated. Unroll fruit snack rolls. 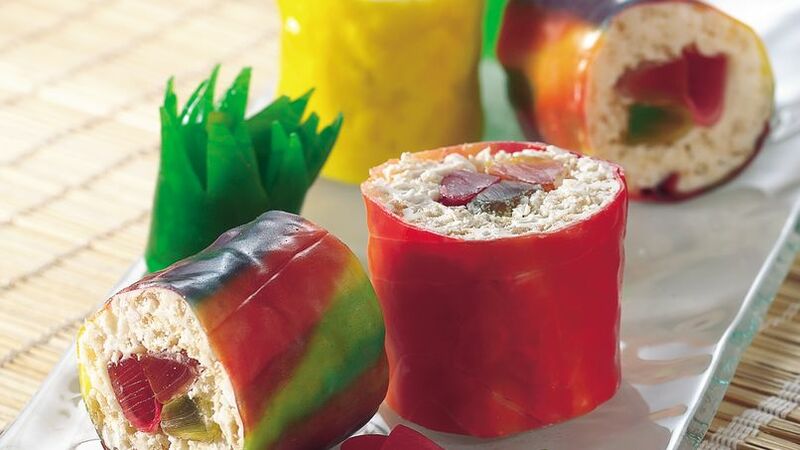 For each sushi roll, spread 1/4 of cereal mixture on snack roll to within 1/2 inch of one short side. Arrange 3 candy worms, side by side, on cereal-covered short side. Starting with short side topped with candy worms, roll up each snack roll tightly, pressing unfilled short side of roll to seal. Let sushi rolls stand 5 to 10 minutes or until firm. Cut each roll into 4 slices.